Jakarta: Like Manila but with really good fabric! A really fun activity to do in Jakarta is to go shopping for batik. Everyone’s heard of batik, although I am learning it means a lot of different things to different people. To me, it just meant a method of dyeing fabric using wax to create designs, which of course is accurate in a very general way. What I didn’t even come close to understanding is the range and style of designs that Indonesia produces under the label batik. It was pretty overwhelming in a very good way. 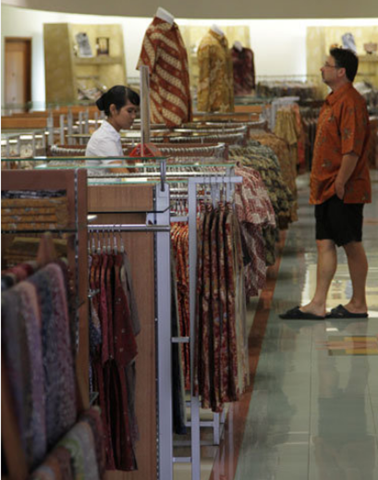 We headed to Pasaraya department store in Jakarta to explore the batik offerings there. I was in awe to see one very, very large floor devoted just to batik. It took about 2 hours to make the full loop around as the choices and styles were so many. Intricate fabric designs as far as the eye could see. There were lengths of fabric and garments for men, women and children. Handbags, scarves, wall hangings…but particularly men’s shirts. Thousands of them, in every size including Western men’s sizes. It was sort of compelling and overwhelming at the same time to work through the different designs. I found myself less attracted to the very traditional designs with borders around the bottom, preferring more repetitious patterns. An influence of Western taste, I’m sure. It took a while to accept the individuality of all the fabric pieces. No two pieces were the same and the fact that they were sold in 2 meter lengths meant that if I wanted to make something myself with only one pattern, I was limited to something small. I’m accustomed to buying fabric by the yard or metre, but these were handcrafted fabrics and designs, not mass produced bolts. The prices were really reasonable for something so intricate and handmade. A typical price for a 2 meter length was $30-60. But it was also hard to commit that much cash to something that I liked but wasn’t sure how I was going to use it. Its not hosted at YouTube so I don’t know how to embed it. But its only six minutes and worth a watch. I loved seeing the different designs come to life. And it really explained to me why the lengths are 2 meters long! Apparently the Pasaraya department store has another floor devoted only to wooden handicrafts. I’d had enough shopping by the time I had finished with the batik, and the Philippines does wooden and raffia items very well. So I decided not to visit, which was probably just as well as I’d spent quite enough already. Walking around through all the different displays, after a while my eye started to tune into the different styles a little bit. Of course, there were different traditional styles customs in different regions on Indonesia – or different islands probably. I couldn’t even begin to figure out which was which. But if you wanted to see, learn, and shop batik for a short flying visit to Jakarta. I couldn’t think of a better spot. Many thanks to Rika for taking me around. 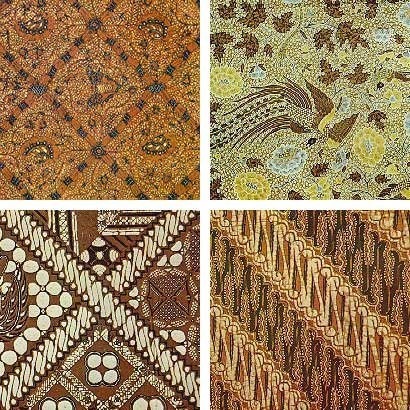 A selection of different batik designs. Where to start?! Mimi would certainly have suggested that you could make lots of pillows out of those differently patterned 2 meter lengths!